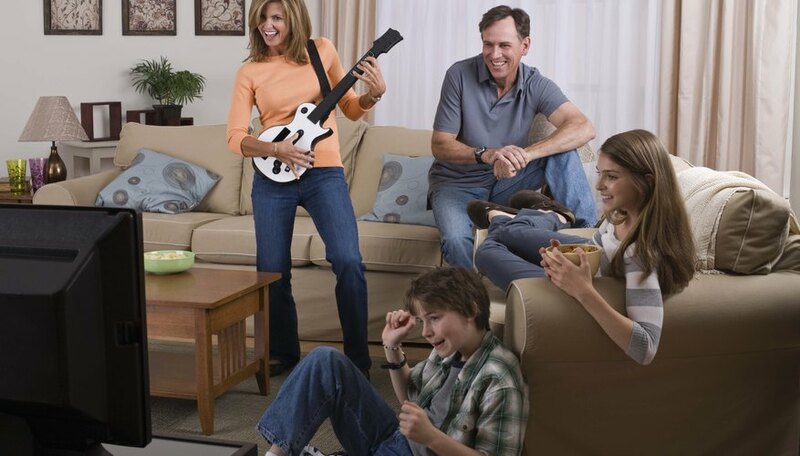 The first three entries in Activision’s highly popular “Guitar Hero” video game franchise allowed players to use guitar-shaped controllers to play along with a collection of hit rock and roll songs. The later entries in the series--“Guitar Hero: World Tour” and “Guitar Hero 5”--also gave players the ability to play drum parts by using a wireless drum kit controller. Using the drum kit requires players to set up both the kit and the included wireless signal receiver. Assemble the drum kit following the instructions in the game manual. Insert the batteries into the battery compartment on the back of the drum kit. Plug the wireless receiver into the USB port on the front of the PS2. Turn on the PS2 and insert the “Guitar Hero” game disc. Press the “PS” button on the drum kit to turn it on. Press and hold the “Connect” button on the wireless receiver. Immediately press the “PS” button on the drum kit. The drum kit will connect with the receiver, and you will be able to begin playing. Activision: How do I set up a full band on the PS2? Based in New Mexico, Carlos Soto has written video gaming and technology articles since 2005. His writing has appeared on popular websites such as GameFAQs and Destructoid. He earned a Bachelor of Fine Arts in dramatic writing from New York University.